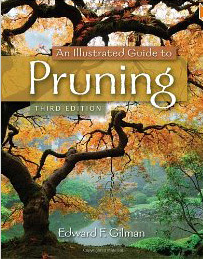 An Illustrated Guide to Pruning is not your typical hobbyist-pruning book. Dr. Gilman and his colleagues at the University of Florida developed this book based on years of research and field observations. It is for someone who wants to understand the science and biology behind pruning as well as understanding the proper way to prune in every situation. While written as a textbook, it is a great reference guide for a homeowner, professional, or someone who wants to learn about proper tree care. The book is full of drawings and examples that make it easy to select which method to use. For instance, there is a chapter which outlines pruning younger trees to encourage proper growth. It outlines the development of those trees, what other problems you might encounter during the tree’s life, and how to mitigate those issues. Chapters topics include: plant selection, tree structure, compartmentalization and tissue, pruning cuts, pruning tools, when to prune, shrub pruning, root pruning and maintaining and developing special forms (like espaliered, pollarded and fruit trees). Each chapter ends with 10-15 multiple choice questions regarding key points as well as 3-5 additional essay challenge questions. The book suggests 3-5 exercises that will help you implement your knowledge. Later in the book, topics that apply to the nursery industry are discussed, but there are take-away points that can be helpful for homeowners when searching for the perfect tree for their property. No matter what level of tree knowledge you have, this book will definitely change your perspective on how to prune. Don’t be surprised if you find yourself predicting which pruning methods will help improve the longevity of the trees around you! Sorry Jan, we forgot to mention that in the article. A copy is available in the Scott Horticultural Library.